We believe photography is an investment that should be something that you and your family can enjoy for years to come, while still being affordable and stress free. 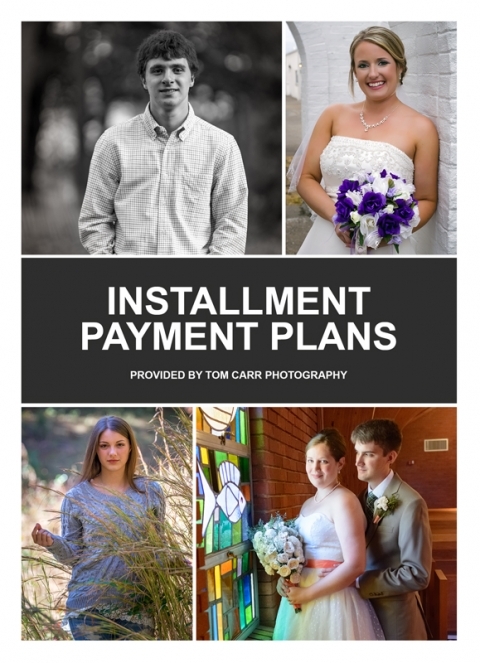 Hence, we are proud to offer you customized installment payment plans for wedding or senior packages valued at $400 or more. Installment plans apply only to the full amount of the package and cannot be used in conjunction with and other discount or promotional prices. So contact us today and let’s get that photography session booked that you have been holding off on. It’s now more affordable with our payment plans. Fill out and submit the online agreement, or download and print a copy by clicking on the image below and mail it in today at the address below. If you would like to speak to us about setting up an installment plan, please fill out the form and include your contact information and the best time to reach you and submit the installment agreement form here and we will contact you as soon as time allows!